Faiza Beauty Cream is increasingly popular product now a days in UAE, Pakistan, India, Africa & many other countries of world. We have observed that some of people selling fake products with our name in market with same name as Faiza Beauty Cream. This is becoming confusing for customer that how to differentiate between original & fake products, because both were very similar and alike. 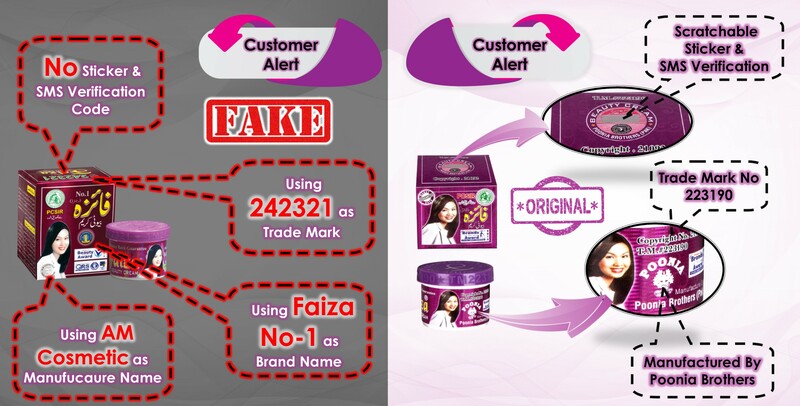 Here are the details by which customers can differentiate between original & fake Faiza Beauty Cream. Original Product do have Trade Mark (T.M) as 223190, Fake product mentioned 242321 as Trade Mark. Fake Brand also mentioned No-1 with its name on pack. So Faiza Beauty Cream with No-1 is actually a fake brand. Original Brand have manufacturer as Poonia Brothers and Fake Brand mentioned manufacturer as AM Cosmetics. So the Brand from Poonia Brothers is original brand of Faiza Beauty Cream. The most useful distinction is SMS Code verification. Original Faiza Beauty Cream do have scratchable sticker on product as shown in picture below. Once you scratch, you will get on code such as FB123344. Type this code in your mobile SMS menu & sent on number as given on sticker. After sending message you will receive verification for original product. If the product is fake then this system will update you accordingly. So Trade Mark as 223190, Manufacturing by Poonia Brothers and SMS Verification code are the main factors you should consider before buying Original Faiza Beauty Cream. Do buy Faiza Beauty Cream with code 223190 from Poonia Brothers & never compromise on your skin by buying low price & fake brand.